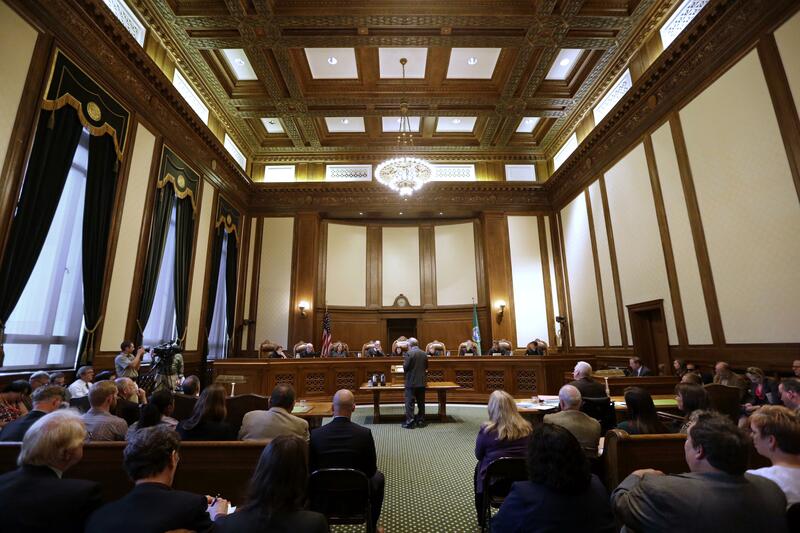 OLYMPIA – The Legislature only came part way to meeting a Supreme Court directive to improve public schools by passing a plan that doesn’t spend enough, soon enough, an attorney for the families who won a landmark decision on education said. The court should order lawmakers to return to Olympia to provide enough money to cover the required education costs by the start of the next school year, attorney Thomas Ahearne said. Or the court should remove tax exemptions, and generate that money. Lawmakers made “real and measurable progress” this year toward the the Sept. 1, 2018 goal the court has set for them, Ahearne said in a 63-page brief filed this week. But it’s the kind of progress previous Legislatures should have made, and this past session should have crossed the finish line, providing all the money necessary to amply fund the actual cost of basic education by next September 1, he argued. The legislation passed this year draws out some of the improvements into the 2019-21 biennium, with sources of money that might not be reliable, and assumes future Legislatures will stick to the plan, Ahearne said. The state maintains in its brief defending lawmakers’ actions that it will be adding $8.3 billion over the next four years. But that’s irrelevant, he contends, because the key point is the state will be adding just $1.45 billion by the 2018 deadline. Some of the money the state is spending comes from a change in the property tax laws, reducing local school district levies and increasing the state levy. “Taking money and handing it back is not an increase,” Ahearne wrote. Some money isn’t for new programs, but for maintaining current programs as student population grow, and the formula the Legislature uses to determine how much money schools fund doesn’t look at their actual costs for many programs. Ahearne’s brief also scoffed at the state’s assertion the plan has “evidence-based” funding levels that lawmakers arrived at after “thorough data review, policy tradeoffs, careful balancing, and co-ordination of implementation.” Not credible, he contends, considering the budget and the education bill were handed to legislators on the last day of the fiscal year and passed in just hours. “Alleging these bills entailed more than a last-minute rush to avoid the impending midnight (state government) shutdown does not pass the straight face test,” he wrote. In separate court filings, other groups also challenged major revisions to the state’s public school system the Legislature passed in June, questioning whether they create problems for local school districts by limiting their levy authority, or adequately provides for special education students, those who need remedial assistance or bilingual education. Some of those friend of the court briefs include legislators who opposed the school plan as inadequate. The state attorney general’s office, which argued in July the state has complied with previous court orders to improve public schools, has until Sept. 8 to respond. The Supreme Court is expected to hear oral arguments this fall.